American Indians, aka Native Americans, living in Oklahoma have a complicated, interesting and unique history. Their story involves hardship, tribal and individual victories, clashes of cultures, and juxtaposed realities with the American mainstream. Several themes resonate throughout the history of Oklahoma Indians, and they all involve a Native reality of physical and metaphysical forces. Understanding these themes gives much insight into the Indian identity. Adaptation and adjustment, always an important part of Native cultures, became an integral part of Oklahoma Indian lives, especially after removal to Indian Territory, as tribal communities rebuilt their governments and medicine people reestablished ceremonial ways. The story of Oklahoma Indians begins with the people already here many centuries ago, the indigenous Spiro Mound builders, 500 to 1300 A.D. Regulators of early trade, these proud people flourished as an extension of the Mississippian mound builders east of the great Mississippi River. In the following generation early people settled along rivers: indigenous Caddoans (Caddo, Wichita, and Pawnee), Siouans (Quapaw and Osage), and Athapascans (Plains Apache). The early Spanish explorer Francisco Vásquez de Coronado recorded observations of Indian activities during the sixteenth century, and his men encountered Plains tribes hunting and raiding in this part of the vast West. Kiowa, Comanche, Arapaho, and Apache raided into the region and claimed hunting territories. The Cheyenne also used the region. 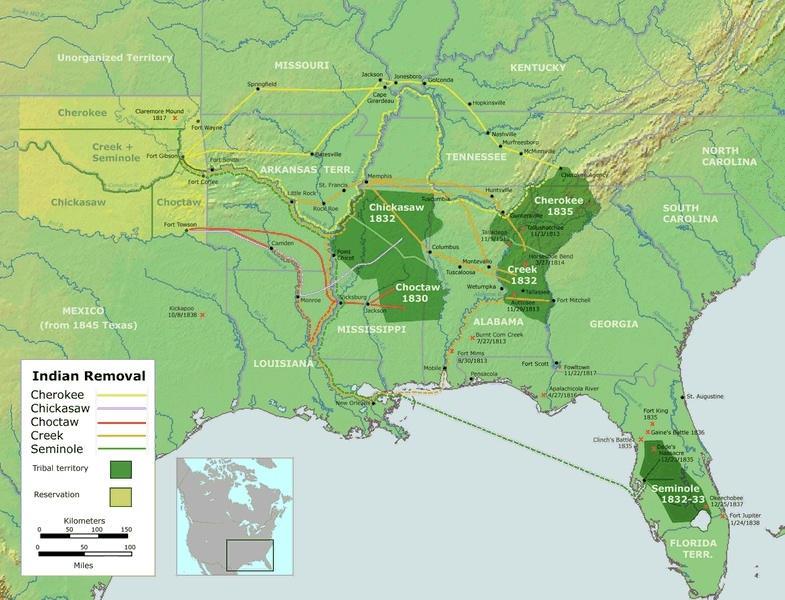 For Native peoples, the early decades of the nineteenth century became the period of "Indian Removal." Over a period of years in the 1830s the U.S. government removed eastern Indian tribes to Indian Territory. These people included the Cherokee, Creek, Seminole, Chickasaw, and Choctaw. Other southeastern tribes included the Alabama. Later, around the time of the Civil War and afterward, removed tribes from the Northeast would join them the Delaware, Sac and Fox, Shawnee, Potawatomi, Kickapoo, Peoria, Ottawa, Wyandotte, Seneca, and Iowa. 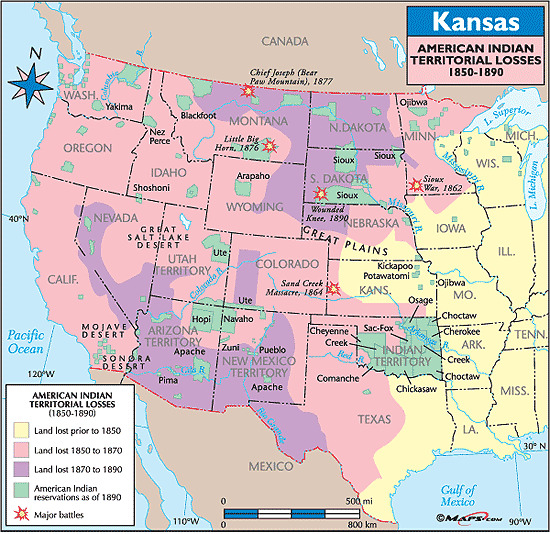 Prairie tribes included the Kaw, Ponca, Otoe, and Missouri. The Indian Wars of the 1870s produced "reservations" in the Oklahoma region for Plains tribes such as the Comanche, Kiowa, Cheyenne, Arapaho, and others. Further western tribes represented here included the Nez Perce and Modoc. In the end, the U.S. government removed a total of sixty-seven different tribes. All of these peoples and their communities developed cultures whose traditions have survived today in spite of several setbacks due to contact with non-Indians. After Indian Removal and reservation making brought them here, these Native peoples adapted to the environmental conditions and climate. Elemental forces of creation the sun, water, earth, and wind guided their daily lives. Daily rituals of life and many traditional ceremonies continued to be practiced on a regular basis and continued to evolve as the indigenous cultures reemerged and re-adapted to new conditions. The oral tradition of storytelling preserved legends about important leaders and events and also recorded verbal accounts of new experiences and leaders. Thus, tribal accounts of the past continue to be based on oral tradition, rather than written, documentary sources. The survival and success of Oklahoma Indians incorporates several significant themes. One theme involves a learned, shared experience that comprises a presumptive "collective identity" called "Oklahoma Indian." It has been said by many non-Oklahoma Indians and noted by other people that Oklahoma Indians are "different." But why? Perhaps they are so because of the collective experience of tragedy and triumph, defeat and survival, destruction and reconstruction, a shared fate of having to overcome setbacks and being forced to rebuild their communities and their nations several times. Oklahoma Indians are much like the metaphorical phoenix rising from the ashes in a rebirth. Each time, Oklahoma Indians have had to reconstruct their families, homes, communities, and nations. A second theme involves the Indian view of the universe, of the physical and metaphysical worlds that comprise the Indian universe. The reality of Oklahoma Indians is one that comprises seeming contradictions: on the one hand, there is a continuation of traditional values and beliefs, deriving from their ancient forefathers from all parts of America. On the other hand, there is a progressive outlook. This "Indianness" is usually manifested via mixed-bloods raised in the Oklahoma Indian communities. Oklahoma Indians are steeped in this Native ethos. The tribes of Oklahoma carried the ethos, the beliefs, with them during their removals to the Indian Territory, and it sustained them while they rebuilt their fires of communities during the nineteenth century. In this Native mind set, physical and metaphysical dimensions work in tandem, so that dreams, visions, and aberrations are very much a part of the reality and the "day" consciousness of Indian people. In addition, Oklahoma Indians who hold closest to their traditional beliefs also bear witness to the influence of ghosts, spirits, and witches in their lives. Indian traditionalists believe that spiritual beings have control over their lives, and they use protective medicines and take precautions to keep themselves safe. In this kind of life, the metaphysical is more powerful than the physical world, and certain ceremonies and important rites need to be performed in order to ensure that greater powers will give protection or bestow blessings. Whether ultra-traditional or progressive, the vast majority of these people are industrious, hard-working, educated, and intelligent. A third theme involves the traditional Native belief in devotion to family and community, with a corresponding de-emphasis on the "individual" person. In this scheme of things, a natural democracy exists among human beings, flora, and fauna; a physical creation such as a river, a meadow, a mountain, or a cloud also has a life and a spirit. Man is not above nature. All things are related. Within this natural democracy, the Creator made a universe of four elements earth, fire, water, and air. From earth springs life; fire, also represented by sun, gives light and warmth; water, a substance necessary for life, is also symbolized by blood; and air is not only the oxygen for breathing but is also the wind of a tornado or even a song carried on the wings of the wind. Indians believe in fate and believe certain things were meant to be, since all is in order according to the Creator. Thus, Native logic is guided by the knowledge that the metaphysical and physical forces both operate in life, by thinking from a communal perspective, and also by thinking in a circular pattern. As nonlinear people, Indians are cyclical by nature. Day changing into night is a cycle, the full moon's monthly repetition is another cycle, and the seasons rotate as well. Life itself, then, is a rotation of circles. Indian peoples' concept of time is that their stories, transmitted through the oral tradition, enliven the past, and that prophecies bring the future back to the present in a time continuum. This is Indian reality; this is the thought pattern of Oklahoma traditional Indians. Nonlinear reality is a powerful theme in the Oklahoma Indian experience. The presence of the white man and development of the United States government and its military brought radical change to Indians in their home regions. It also brought about the forced removal of Indian nations from many parts of the United States to what was called Indian Territory. The ensuing destruction of Native peoples' settled lives also reflects the history of Oklahoma and that of Oklahoma Indians. Moving fires is another powerful theme in native traditional history because the people had to camp frequently during the sad process of being forced to come to Indian Territory. Many died along the trail; hence, the people created a new terminology to describe the experience: the Trail of Tears, or the Trail of Courage (also called Trail of Death) in the case of the Potawatomi. During the 1840s and 1850s missionaries, especially the Baptists, Methodists, and Presbyterians, worked among the tribes to help the people, and in the process they converted many Indians to Christianity. Thereafter, many Indians practiced both Christianity and traditional beliefs and continued to do so even into the twenty-first century. Many tribal leaders viewed education as an important social mechanism, and schools were built all over the Indian nations during the pre Civil War years. In the 1860s the United States and also the territories became embroiled in the struggle between North and South. Forced to fight for the Confederacy, the tribes of Indian Territory suffered much devastation and death in their homeland, and their lives were uprooted again. The largest conflict of the American Civil War in Oklahoma was the Battle of Honey Springs on July 17, 1863. Involving nine thousand soldiers, it represented a turning of the war in favor of the North. Gen. Stand Watie, a Cherokee, was the last Confederate general to surrender. A Union victory, and the tribes' allegiance to the Confederacy, compelled retaliation by the United States. Forced to sign the Reconstruction Treaties of 1866, the Five Civilized Tribes found their lands reduced in order for the U.S. to move more western tribes into Indian Territory. Subsequently, railroads were allowed across Indian lands. Despite these hardships, the tribes rebuilt their lives and rekindled community fires again during the era that mainstream historians call Reconstruction. Mixed-blood Indians and all of those who were progressive toward the ways of the white man believed that seminaries, missions, and schools were important and continued building them. In the late nineteenth century Oklahoma Indians of all tribes and nations experienced a new federal Indian policy, much of which was aimed at destroying de facto tribal sovereignty by ending the traditional Indian system of tribal, rather than individual, land ownership. The much-debated Dawes Severalty Act (General Allotment Act) of 1887 promised individual land ownership and U.S. citizenship to American Indians. Although the Oklahoma tribes of the eastern half of the Indian Territory at first were exempt from the Dawes Act, successive amendments to the law began the process of allotment of tribal lands to individual Indians. The Jerome Commission and Dawes Commission carried out the surveying and distributing of allotments to the tribes. The recipients were registered in what came to be called the Dawes Rolls of tribal memberships. Over all, allotment of tribal land stripped Oklahoma Indian nations of about twenty-seven million acres. Then came an in-migration of fifty thousand non-Indian settlers with the first land opening, the Land Run of April 22, 1889, into the Unassigned Lands of central Oklahoma. Within the next two decades additional land lotteries brought hundreds of thousands more outsiders into the territories, but primarily into the western half of present Oklahoma. Cattlemen and mining interests in southeastern Indian Territory increased pressure for white ways among the tribes and caused political strife within tribes as Indian Territory became increasingly open to white opportunists. The Curtis Act of 1898, designed to permanently dissolve all formal tribal governments, cancelled reservation status and nullified tribal schools and judicial systems. Political pressure for statehood compelled Indian tribes to push for a state of their own, called the State of Sequoyah, but they had little lobbying power in Washington. Despite these setbacks, and despite the federal demand for the end of tribal sovereignty, informal government still ran most tribes' affairs. The Indian nations did not disappear. They rebuilt again following Oklahoma statehood in 1907, when federal paternalism suppressed their sovereignty. Of an estimated ten thousand American Indians who served in World War I for the United States, many of them from Oklahoma. Although many Oklahoma Indians became U.S. citizens upon receiving land allotments, they ultimately lost their lands by fraud and deception from white opportunists. During the Great Depression that began in 1929 and held on into the 1930s, Indian communities suffered as did all Americans. Many Oklahoma Indians moved westward during the Dust Bowl years. An increasing Native population in California was part of the now-famous Dust Bowl migration. Like the Dawes Act, the Indian Reorganization Act (IRA) of 1934 exempted American Indians of Oklahoma. Two years later the Oklahoma Indian Welfare Act extended IRA provisions, allowing Oklahoma Indians to reestablish tribal entities and Indian communities into Native governments patterned after the U.S. government. Other provisions of this Indian New Deal legislation helped Oklahoma Indian communities, as well as communities throughout Indian Country, to pull through the Great Depression. The sudden entrance of the United States into World War II in 1941 encouraged many Oklahoma Indian young men to join the armed services. Oklahoma Indians, many of whom were already members of National Guard units, filled a noticeable portion of the ranks of the U.S. Army's famed Forty-fifth Division. Serving courageously, Oklahoma Indians earned many medals. Ernest Childers, a Muscogee Creek, and Jack Montgomery, a Cherokee, won Congressional Medals of Honor. They were the only Native Americans to win the nation's highest military honor in World War II. Following the war, Congress recognized the United Keetoowah Band of Indians under the Oklahoma Indian Welfare Act, but further recognition of tribes in general halted in the following decade. 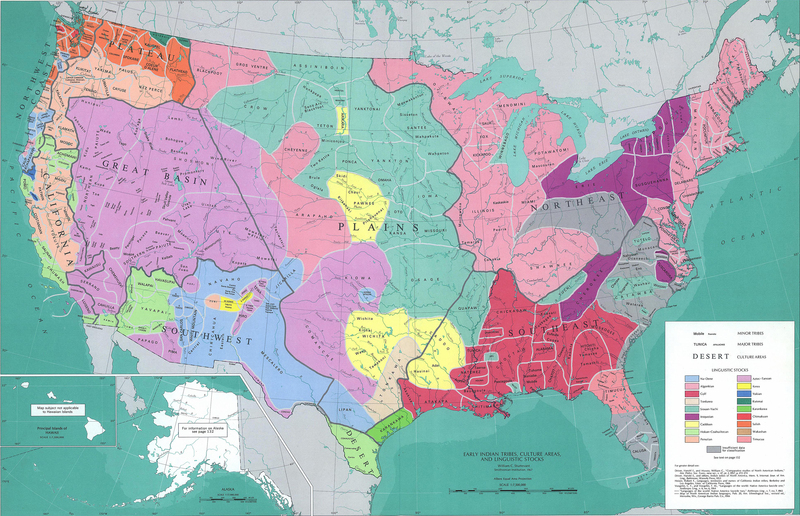 The Five Civilized Tribes is the term applied to five American Indian (aka Native American) nations: the Cherokee, Chickasaw, Choctaw, Creek, and Seminole. They were considered civilized by white society because they had adopted many of the colonists' customs and had generally good relations with their neighbors. Termination, a new federal Indian policy of the 1950s and 1960s, once again threatened to end all tribal self-government, but Oklahoma tribes were able to avoid the final ending of trust obligations by the United States. Tribal governments remained under the firm control of the Bureau of Indian Affairs of the Department of the Interior. The Relocation Program of 1952, however, affected many individual Oklahoma Indians by sending them to major cities for employment and housing. This program continued until the early 1970s and in many instances had negative consequences for Native family life. The cycle of change continued through the twentieth century. In 1975 the Indian Self-Determination and Education Assistance Act supported and reinforced tribal governments. 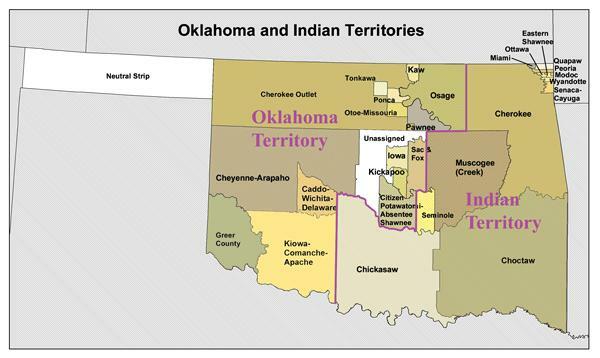 As a result of the IRA legislation and Indian self-determination policy, American Indians in Oklahoma formed thirty-nine tribal governments that have been federally recognized. These nations exercise powers of self-government, including business councils, and many have tribal courts with law enforcement. These tribal governments and communities have formed a positive relationship with the state of Oklahoma, and their progress in the last decades of the twentieth century truly reflect Oklahoma's deep heritage as the "Land of the Red Man." Self-determination was a modest boon to the Oklahoma Indian community's economy. By the end of the twentieth century twenty-three bingo and gaming operations were owned by the tribes in Oklahoma. Eight tribes the Choctaw Nation, Citizen Band of Potawatomi Nation, Comanche Indian Tribe, Iowa Tribe, Miami Tribe, Modoc Tribe of Oklahoma, Otoe-Missouri Tribe, and Tonkawa Tribe of Indians had successfully negotiated gaming compacts with the State of Oklahoma. In addition to gaming, the Oklahoma tribes invested in various businesses and industries, and their success produced tribal programs of college scholarships, elder care, health care services, and other social services. Old fires of communal life were renewed as the Oklahoma tribes developed new economic and health programs to assist their peoples. Cultural revitalization among Oklahoma's Indian communities has followed the national pattern from the 1920s. The pan-Indian movements of the early and mid-twentieth century, as well as cultural activities generated by the Indian Arts and Crafts Act of 1935 and the 1978 American Indian Religious Freedom Act, motivated many tribes to reinstate traditional sacred rites and ceremonies and also to present public events expressing Native community identity. For example, many tribes now host an annual heritage day, festival, or homecoming. Powwows and dances, both private and public, became regular community activities in the late twentieth century. Revival of arts and crafts also became important as forces to unify Native communities and also to generate much-needed income. Tribal historic preservation officers monitor threats to sites important in the community's history. Many tribes have opened museums at tribal headquarters complexes. Most importantly, because the survival of language is the key to the survival of culture, many Oklahoma tribes have instituted preservation policies and activities, such as language classes and dictionary compilation projects. The Oklahoma Indian experience is a collective saga of many encounters with external forces that caused permanent changes to traditional communities. All of the recurring themes of Indian removal, renewed tribalism, moving fires, destruction, rebirth, Native ethos, Native sovereignty, identity, and inherent communal beliefs comprise a collective epic. It reflects the Native peoples' strength and traditionalism within a Native reality that experienced and successfully withstood abrupt changes. These resilient people have integrated a successful dichotomy (traditionalism and progressivism) as a part of their lives and prosperity. Other updated information includes: a revised section on Canada, including Nunavut, the first new Canadian territory created since 1949, with a population that is 85% Inuit; the latest statistics and new federal laws on tribal enterprises, including a new section on "Indian Gaming"; and current information on preferred names now in use by certain tribes and groups, such as the use of "Inuit" rather than "Eskimo." BIBLIOGRAPHY: Jeffrey Burton, Indian Territory and the United States, 1866-1906: Courts, Government, and the Movement for Oklahoma Statehood (Norman: University of Oklahoma Press, 1995). Robert J. Conley, The Witch of Goingsnake and Other Stories (Norman: University of Oklahoma Press, 1988). Mary B. Davis, ed., Native America in the Twentieth Century: An Encyclopedia (New York: Garland Publishing, Inc., 1994). Angie Debo, And Still The Waters Run: The Betrayal of the Five Civilized Tribes (Princeton, N. J.: Princeton University Press, 1940; reprint, Norman: University of Oklahoma Press, 1984). Angie Debo, The Road to Disappearance: A History of the Creek Indians (Norman: University of Oklahoma Press, 1941). Angie Debo, The Rise and Fall of the Choctaw Republic (2d ed. ; Norman: University of Oklahoma Press, 1961). Clyde Ellis, To Change Them Forever: Indian Education at the Rainy Mountain Boarding School, 1893-1920 (Norman: University of Oklahoma Press. 1996). Dianna Everett, The Texas Cherokees: A People Between Two Fires, 1819-1840 (Norman: University of Oklahoma Press, 1990). Sandra Faiman-Silva, Choctaws at the Crossroads: The Political Economy Class and Culture in the Oklahoma Timber Region (Lincoln: University of Nebraska Press, 1997). Grant Foreman, Advancing the Frontier, 1830-1860 (Norman: University of Oklahoma Press, 1933). Grant Foreman, The Five Civilized Tribes: Cherokee, Chickasaw, Choctaw, Creek, Seminole (Norman: University of Oklahoma Press, 1934). Grant Foreman, Indian Removal: The Emigration of the Five Civilized Tribes of Indians (Norman: University of Oklahoma Press, 1932). Kenny Franks, Stand Watie and the Agony of the Cherokee Nation (Memphis, Tenn.: Memphis State University Press, 1979). Arrell M. Gibson, The Chickasaws (Norman: University of Oklahoma Press, 1972). James H. Howard, with Willie Lena, Oklahoma Seminoles, Medicines, Magic, and Religion (Norman: University of Oklahoma Press, 1984). Jack F. Kilpatrick and Anna G. Kilpatrick, Friends of Thunder: Folktales of the Oklahoma Cherokee (Norman: University of Oklahoma Press, 1994). Georgia Rae Leeds, The United Keetoowah Band of Cherokee Indians in Oklahoma (New York: Peter Lang, 1996). Daniel L. Littlefield, Jr., Alex Posey, Creek Poet, Journalist, & Humorist (Lincoln: University of Nebraska Press, 1991). Daniel L. Littlefield, Jr., and Carol A. Petty Hunter, eds., The Fus Fixico Letters (Lincoln: University of Nebraska Press, 1993). K. Tsianina Lomawaima, They Called It Prairie Light: The Story of Chilocco Indian School (Lincoln: University of Nebraska Press, 1994). William McLoughlin, The Cherokee Ghost Dance (Macon, Ga.: Mercer University Press, 1984). Edwin C. McReynolds, The Seminoles (Norman: University of Oklahoma Press, 1957). Wilma Mankiller and Michael Wallis, Mankiller: A Chief and Her People (New York: St. Martin's Press, 1993). V. V. Masterson, The Katy Railroad and the Last Frontier (Norman: University of Oklahoma Press, 1953). John Joseph Mathews, The Osages: Children of the Middle Waters (Norman: University of Oklahoma Press, 1961). Amos D. Maxwell, The Sequoyah Constitutional Convention (Boston: Meador Publishing Co., 1953). Katja May, African Americans and Native Americans in the Creek and Cherokee Nations, 1830s to 1920s (New York: Garland Publishing, Inc., 1996). William C. Meadows, Kiowa, Apache, and Comanche Military Societies: Enduring Veterans, 1800 to the Present (Austin: University of Texas Press, 1999). Howard L. Meredith, Bartley Milam: Principal Chief of the Cherokee Nation (Muskogee, Okla.: Indian University Press. 1985). Devon A. Mihesuah, Cultivating the Rosebuds: The Education of Women at the Cherokee Female Seminary, 1851-1909 (Urbana: University of Illinois Press, 1993). H. Craig Miner, The Corporation and the Indian: Tribal Sovereignty And Industrial Civilization in Indian Territory, 1865-1907 (Columbia: University of Missouri Press, 1976). James D. Morrison, The Social History of the Choctaw Nation: 1865-1907 (Durant, Okla.: Creative Informatics, Inc., 1987). Theda Perdue, ed., Nations Remembered: An Oral History of the Five Civilized Tribes, 1865-1907 (Westport, Conn.. Greenwood Press, 1980). Carl C. Rister, Land Hunger: David L. Payne and the Boomers (Norman: University of Oklahoma Press, 1942). Christine Schultze and Benton R. White, Now the Wolf Has Come: The Creek Nation in the Civil War (College Station: Texas A&M University Press, 1996). George A. Schultz, An Indian Canaan: Isaac McCoy and the Vision for an Indian State (Norman: University of Oklahoma Press, 1972). Alexander Spoehr, Changing Kinship Systems: A Study in the Acculturation of the Creeks, Cherokee, and Choctaw (Chicago: Field Museum of Natural History, 1947). Emmet Starr, History of the Cherokee Indians and Their Legends and Folk Lore (Oklahoma City, Okla.: The Warden Co., 1921; reprinted Tulsa, Okla.: Oklahoma Yesterday Publications, 1984). Rennard A. Strickland, Fire and the Spirits: Cherokee Law from Clan to Court (Norman: University of Oklahoma Press, 1975). Rennard Strickland, The Indians of Oklahoma (Norman: University of Oklahoma Press, 1981). John R. Swanton, Social Organization and Social Usage of the Indians of the Creek Confederacy, Forty-Second Annual Report of the Bureau of American Ethnology, 1924-25 (Washington, D.C.: Smithsonian Institution, 1928). William R. Unrau, Mixed-bloods and Tribal Dissoluton: Charles Curtis and the Quest for Indian Identity (Lawrence: University of Kansas Press, 1989). Mary Jane Warde, George Washington Grayson and the Creek Nation, 1843-1920 (Norman: University of Oklahoma Press, 1999). Morris L. Wardell, A Political History of the Cherokee Nation, 1838-1907 (Norman: University of Oklahoma Press, 1938). Terry P. Wilson, The Underground Reservation: Osage Oil (Lincoln: University of Nebraska Press, 1985). Grace Steele Woodward, The Cherokees (Norman: University of Oklahoma Press, 1963). Muriel H. Wright, A Guide to the Indian Tribes of Oklahoma (Norman: University of Oklahoma Press, 1951).